In the age where everything is documented action cameras have come to be extremely popular. Big camera brands each have their own version of these cameras. The most distinguished or reputable product is the Hero series from GoPro. GoPro cameras dominate the market because they offer above average specs, fun features, various mounting options, sturdiness, amazing quality and as per expected, a large price tag. Not everyone can get their hands on one. However, if you are looking for an action cam but do not want to sell your family heirloom, fear not there are such things as clones. The SJ4000 is the GoPro Hero 3+ bootleg, so alike you can mistake it for one at first. The size and shape of the SJ4000 is exactly the same as the GoPro, as well as the UI (user interface) design. There are only 4 buttons on this small device – the power button, OK/trigger button and scrolling (up, down) buttons on one side. There are ports for micro SD, micro USB, and micro HDMI all conveniently located. The battery can be accessed at the bottom through a stubborn cover. Even with the battery, the SJ4000 is so light that I start to question the robustness. However, the waterproof casing seems sturdy enough to handle reasonable force. The SJ4000, priced at around US$140, comes with a variety of mounts, connectors, straps, and a waterproof shell. The mounts and connectors are made of a seemingly strong plastic with steel bolt connectors. 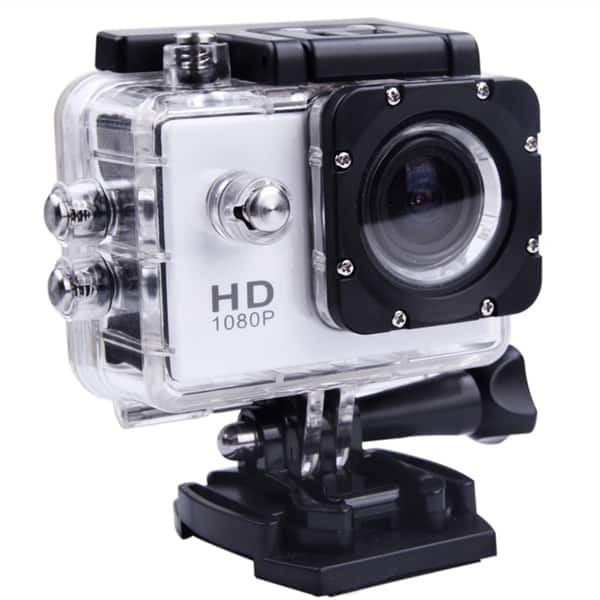 The waterproof casing is designed very closely to the GoPro casing as well. I tested the reliability of the casing with a humidity checker and submerging it in water for some time. Unfortunately, the 5% and 10% indicators were triggered as shown. But I am sure a bit more of reinforcement would be fine. The camera supports micro SD cards around 32GB. There is a micro HDMI port which is fully functional to project this screen display. The port, nonetheless, has a less than perfect fit – it can lose the HDMI cable connection in certain positions. The micro USB conversely fits perfectly in the interface. The preview screen is a really nice feature, and is actually a huge step up from earlier models in the GoPro Hero series in this particular aspect. There is no requirement of an external device to receive an FPV while setting up/mounting this camera. The camera has an individual immensely long list of set up configuration options. Video, photo, and general settings are listed randomly in the set up menu. 1080p 30fps automagically, but may be changed to help 720p 60fps, 720p 30fps, WVGA, and also VGA. Honestly though, these cons are on the boundary of being extremely picky. For the price of this camera, some things are bound to have imperfections, and this one has these – very very small and minor issues, easily remedied with a bit of reinforcements for the accessories and some editing for the video and color bug.